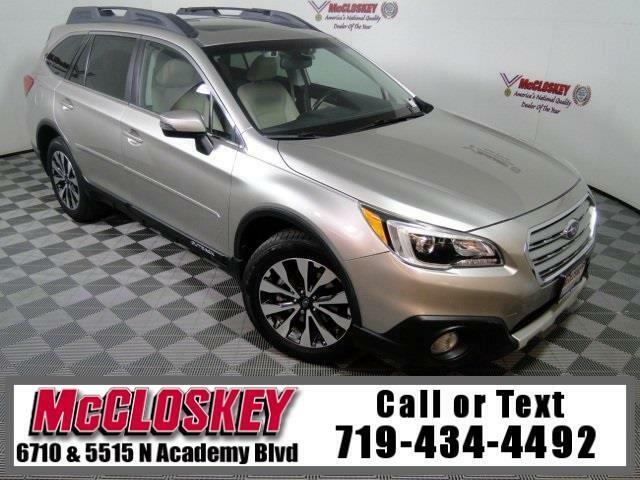 Pristine and well-equipped 2015 Subaru Outback 3.6R Limited with Navigation System, Eye Sight Technology, Adaptive Cruise Control, Harman Kardon Sound System, and Backup Camera! Stepping up to the 3.6R Limited adds 18-inch alloy wheels, active foglights (these turn with the front wheels), a front skid plate, a power liftgate, blind-spot monitoring with rear cross-traffic alert, leather upholstery, driver memory settings, a four-way power passenger seat, heated rear seats, wood trim and a nine-speaker Harman Kardon sound system. The 3.6R Limited features a 3.6-liter six-cylinder engine rated at 256 hp and 247 lb-ft of torque. This vehicle passed our 110 multi-point inspection and is backed by our National Quality Dealer of the Year Award. We are an ''A+'' Better Business Bureau Rated Business. We offer low interest rate financing, low down payments and the highest trade allowances in the state! Here at McCloskey we do things a bit differently, we shop our competition every day to ensure a great value to you. Come on down and experience it for yourself. This McCloskey Assured vehicle includes a 2 month/2000 mile Warranty and a Vehicle History Report!! At McCloskey we strive to provide ASSURANCE, TRUST, VALUE AND QUALITY! Call 719-434-4492.